We Specialize in Small Group Classes. Ensuring you Have the Individual Attention you Need. 1963 Innisfil Beach Road, Innisfil, ON. L9S 4B4. The Facility/School is Heated and Air Conditioned. $164.00 inc tax for a 6-week course. Homework notes provided by e-mail after each class. Lifetime support for all clients via phone or e-mail. A Regular Flat Buckle, Six Foot Leash & 2 or 3 kinds of Soft Training Treats. Two or Three kinds of soft training treats. Examples: Dehydrated or Freeze Dried Liver, Chicken or White Fish, Blue Buffalo’s Blue Bits, Zukes, Wellness Wellbites, Simply Nourish, Cheese, Hot Dogs, Rollover Bits. – Health/Vaccination Record or Vet’s Invoice for vaccinations. – Bordatella (Kennel Cough) Recommended. Potty Training, Nipping & Chewing, Sit, Down, Come, Loose Leash Walking, Drop It, Leave It, Stay, Wait, Greetings (Yourself, Visitors, Strangers), Barking. Understanding how dogs communicate. Nipping & Chewing, Sit, Down, Come, Loose Leash Walking, Drop It, Leave It, Stay, Wait & Stay with Distance, Greetings (Yourself, Visitors, Strangers), Barking. Understanding how dogs communicate. Working with Distractions, Heel Walk, Distance Down, Wait, Stays -(Increased Time, Distance & Distraction), Distractions to Come, Around, Stand/Stack for examination. Working with increased distractions on all basic commands. Stays to 20 feet with distractions, Turns at Heel, Stand Stay, Off Leash Heeling, Return To Heel, Emergency Down. The CD & CGC/CGN & Therapy Dogs Testing, require dogs to perform some or all of the following:- 20 foot one minute Sit Stay, Come when called, Heel on loose leash, negotiate turns at Heel, reaction to startle, reaction to other dogs, reactions to Cane/Walker/Wheelchair/Crutches and person with Altzhimers, Wait at entrance/door, Stand for exam, sit patiently for petting, Leave it, Down at a distance of 10 feet, response to hand signals. Learning how to start your dog using his nose to find things and establishing the beginning of a tracking skill. Fun brain work for your dog, useful, keeps them busy too! Why choose and look for a Certified Dog Trainer? You care about your dog. You want a positive experience for both you and your four-footed friend. Whether you are looking for a training class or private training, you are looking for a high-quality, safe, and effective training experience. When you choose "The Dog Nanny", you can be confident that you are working with a professional who has the knowledge and expertise to make your investment in dog training safe, effective, and even fun! "The Dog Nanny" has extensive dog training skills as well as instructor skills to enhance the experience and success for you and your dog. Marcia Murray-Stoof has earned this credential by demonstrating her knowledge and experience in dog training and testing with several recognised associations. 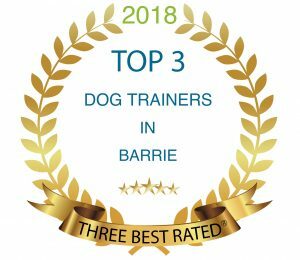 As Certified Dog Training Instructor & Certified Canine Behaviourist she stays informed by continuing to advance her current knowledge in these fields and is familiar with the latest, most effective training techniques and equipment. As a Certified Professional Dog Training Instructor and Certified Canine Behaviourist she adheres to a strict code of Ethics. You may pay by Cash, E-Mail Transfers or Personal Cheques. Payments due 2 weeks prior to the start date. E-Transfers make payable to "thedognanny@bell.net" use your dogs Name as collection Password. Checks please make payable to "Marcia Murray-Stoof"
Cash and Personal Checks can be dropped off at The Academy at anytime. Refunds are not available but fees can be transferred to alternative Class or Private Sessions. Class sizes are limited to ensure personal attention.